For around two weeks from February 22nd to March 8th 2017, twenty-four first-year students along with Associate Professor Fuyuko Takita (Institute for Foreign Language Research and Education) and three other supervising faculty members participated in the 37th START program*, visiting University of Social Sciences and Humanities (USSH) of Vietnam National University Ho Chi Minh City and its surrounding area. 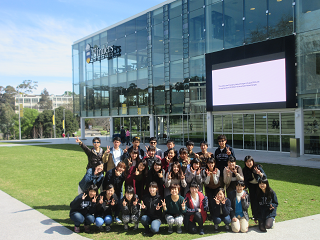 For around two weeks from February 24th to March 13th 2017, thirty first-year students along with Professor Hideki Kuwajima (Graduate School of Integrated Arts and Sciences) and two other supervising faculty members participated in the 38th START program, visiting Flinders University in Adelaide, Australia. For around two weeks from February 28th to March 16th 2017, twenty-four first-year students along with Lecturer Hisashi Kuwayama (Graduate School of Education) and two other supervising faculty members participated in the 39th START program, studying at Chulalongkorn University in Bangkok, the Kingdom of Thailand. On top of attending lectures, the students visited Japanese companies based in Thailand and other educational facilities. From March 10th to 26th 2017, twenty first-year students along with Professor Emiko Nakasaka (Graduate School of Social Sciences), Associate Professor Kazutoshi Suzuki and two other supervising faculty members participated in the 40th START program, studying for around two weeks at the University Rovira i Virgili (URV), in Tarragona, Spain. From March 10th to 26th 2017, thirty first-year students along with Associate Professor Robert Horst Taferner (Graduate School of Integrated Arts and Sciences) and two other supervising faculty members participated in the 41st START program, studying abroad at New Zealand partner university University of Auckland (UoA) for around two weeks. For around two weeks from March 15th to 30th 2017, twenty-four first-year students along with Professor Hiroshi Arami (Graduate School of Integrated Arts and Sciences), Professor Yoshichika Honda (International Center) and one other supervising faculty member participated in the 42nd START program, studying at Fu Jen Catholic University (FJU) in New Taipei, Taiwan. (*) The START Program, aimed at first-year students who have little to no experience in overseas travel, allows students to experience classes and everyday life at an overseas partner university and thus fostering interest in cross-cultural exchange and long-term abroad study. From 2010 to 2016, the START Program has been held 42 times. This program’s fees are supported by the Hiroshima University Fund and other patrons, lessening the financial burden on students and allowing a greater number the opportunity for abroad study. Approximately three months before departure students conduct pre-program research about their destination country, and post-program research after returning to Japan. Moreover, the START Program is offered as a general education credited course (‘overseas field study’), and aims to improve participating students’ global core competency (the core skills needed to succeed anywhere in the world). Through three self-evaluation sessions conducted pre, during, and post study-abroad, students are able to create action plans based on the fostering of their Global Core Competency. After receiving feedback from supervising teachers, students are able to rework and move towards implementing their plans. In the grading process, a student’s program participation attitude, overseas presentation, and post study-abroad report are looked at, and the development of the student’s Global Core Competency is comprehensively evaluated. Furthermore, after returning to Japan students set personal goals for improving their TOEIC scores, and continue their learning even after the completion of the program.